I have always been against the burning or damaging of property. I was there when it happened last year. Unfortunately it was not something that was planned, or should I say we were never told that there were petrol bombs. It happened so fast and I did not know what was going on. That act denied some students assistance; it denied them opportunity while we continued going to class. The block has been fixed now, but it is something I donâ€™t wish to see – especially in a big institution like UKZN. Anyone who does it again must be arrested because it is unfair to other students and to the institution. Yes, a lot of things have changed from last year because everything is normal now [that] the building has been fixed. 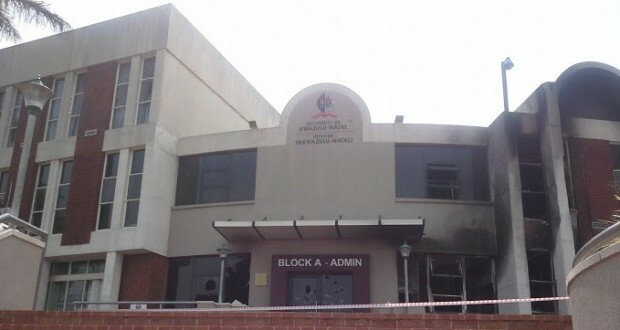 The admin building is very useful because that is where students seek assistance, so we struggled when it was down due to fire started by the same students. Many cases of arson are reported to be happening in many universities and Iâ€™m scared that the students will adopt this style of protest. It seems like they think it is the way forward, but it is not. We will complain when the university hikes the fees because of the damage we do as students. The admin block is a busy place, especially for a big institution like UKZN. Things were hard when it was not working. People go in and out of the building looking for help, especially those who are still applying to study here. The university managed to fix the parts that were affected by fire because they knew the importance of the block. Situations like these are moving us backward – sometimes we as students do things without thinking of the consequences and how it will affect us in the future or those coming after us. When the building burned it was hard for us to carry out our duties to help people – it was very difficult. We had to move to another office with little space and people struggled to find us. People think fire is something to play with. We lost a lot of documents in that fire and records too, which is something that cannot be replaced. But we are back and running; now things are going well. As much as students are the future of this country, when they damage property like this they must be arrested because their actions will affect innocent people who will not get help because of burned down buildings. Things have changed a lot lately. The admin block looks better than before but I wouldnâ€™t say I was affected by the incident because I donâ€™t remember going there looking for help. Even though it might not have helped me, it was useful to others. Burning it down was uncalled for. To be honest, I donâ€™t even know what is going on in there so I was not really affected. Protest is a good way to show your dissatisfaction. but it must be a calm protest. Damaging of property is not a good thing; student leaders must always make sure they emphasise that to students before every protest. Why is Scarlett Johansson in Ghost in the Shell?